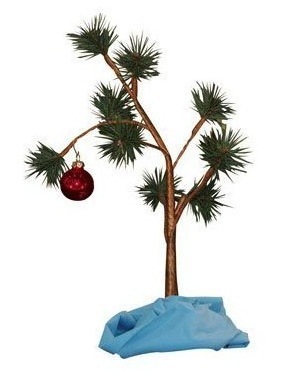 Exclusive Charlie Brown's "Lonely Tree" Christmas Tree With One Red Ornament, Also Included Is Linus's Blue Blanket. Today is International Panic Day, a day for everyone to be worried and concerned. We're not sure what is so big, and so widespread, to create an international incident of this magnitude. 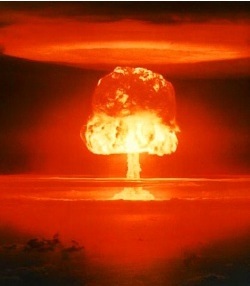 But, here it is on the calendar folks......an international day of panic. I hope everyone is having a good holiday season this year. I'm on the road, so my blogging will be very light for the next two weeks. My new laptop apparently has a bad stick of ram causing it to crash on me, making matters worse. I'm going to pretend its a good thing. I could use a bit of a vacation. This is a student film my cousin did 20 years ago. Its aging like a fine Scotch. Listen to your parents, Santa isn't a man you want to screw with. No peeking.. And if you do see Santa, under no circumstances bother the man. Just let him do his thing and leave..
] truck to take it all out. You guys are going to kill me. This story got some attention earlier this week.. The Penny Arcade guys are up to over $123,000 in donations now, and more are still coming in.
] since they love games, to give games for Christmas. They wound up collecting over $90,000 worth of toys and games to donate. Very cool. I've been a PA reader for years. They have been around a very long time. If you ever happen to meme www.penny-arcade.com, note its extremely low threadid. It was one of the first sites I posted to MemeStreams.